The first time we see Nell Gwynn, she’s one of us. In the Globe’s rowdy retelling of Nell’s rags-to-riches life, the famous restoration actress starts among the groundlings as just another admiring – if mouthy – spectator. Soon, though, she’s treading the boards herself, first at Drury Lane and then on the nation’s stage, as the favoured mistress of King Charles II. Both Jessica Swale’s text and Christopher Luscombe’s production are playfully conscious of their theatrical surroundings. 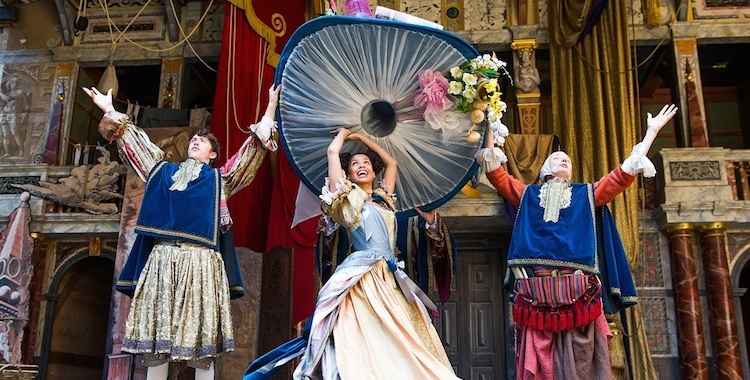 Nell Gwynn is a play about theatre as much as anything else: its joy, its artifice and its uneasy marriage of entertainment and education. This Nell is a people’s heroine, playing to the stalls and courting laughs, but she also has bigger concerns, boldly demanding more from the simpering roles she’s cast in. Swale has bigger concerns too, attempting amid the broad comedy to both reclaim her mythologised protagonist and make some sharp political sideswipes. She meets with mixed success, raising cheers with Charles’s “down with austerity!”, yet pressing a little hard on her vital but overworked points about the representation of women both then and now. The self-aware theatricality can likewise overstate its case at times, though there’s something endearing about the show’s evident love for the art form, even in the very process of sending it up. As played by the effervescent Gugu Mbatha-Raw, Nell is resolutely and joyfully human, recovering the woman from the legend. It’s her sharp wit that charms audience and court alike, while in her relationships she’s more than a match for leading man Charles Hart (Jay Taylor) and later David Sturzaker’s spirited monarch. She is, like the characters she begs an ineffectual John Dryden (Graham Butler) to write for her, a woman “with skin and heart and some sense in her head”. Three and a half centuries later, we could still do with more of those on our stages.